In an effort to share my outrage with the world, I took my newly found trash — the “Stars and Stripes” fishing bait box – to the internet. What I discovered is that our society, however ashamed of it, enables these offenders. If ocean conservationists want to tackle this problem in the real world, we need to reach beyond the current message and audience to find real-world solutions. A dose of psychology might help us face reality. Here’s the response I received when I took my litter campaign to the internet and my assessment of it. “Sometimes the bait boxes blow overboard and can’t be retrieved. Let’s hope this was just an accident, not intentional littering.” In my armchair psychological opinion, this is an enabler’s response. What this reply says to me is “Oh, it’s not their fault, it’s the environment’s fault.” Should we be blaming third parties (or a gust of wind) for the intentional act of a single person? No and I won’t accept this excuse. This box clearly didn’t blow off a boat. 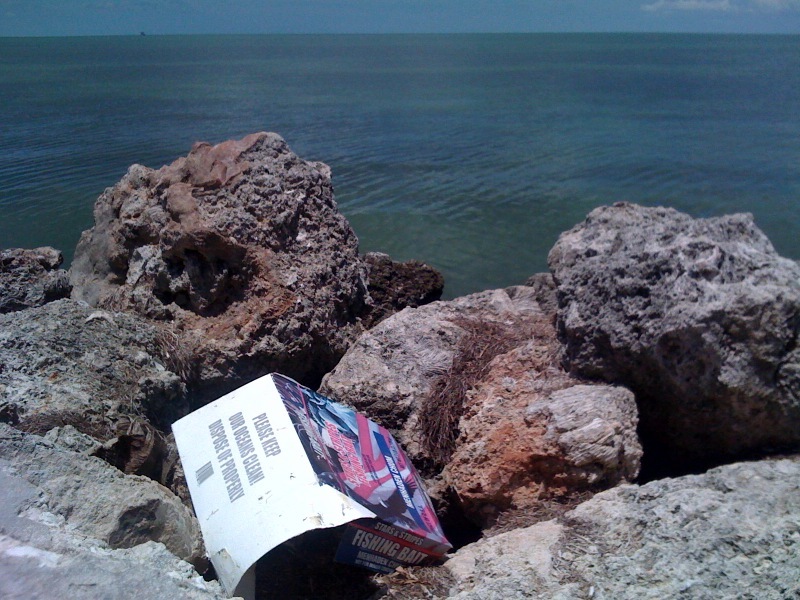 It was in perfect condition, sitting on the rocks overlooking the gorgeous blue ocean waiting for its proper disposal. And, how often do boxes fly off boats anyway? Is this a problem that can be fixed? I tried to share my outrage directly with “Stars and Stripes” but I cannot find them on the internet. I’m not outraged at “Stars and Stripes,” in fact, I wanted to commend them for including the responsible messaging on their bait boxes. I’d like to hope that at least some of their customers read it and, in turn, do the right thing. Maybe they can tackle the “boxes flying off the boat” problem next. But clearly their message, however obvious (for those who speak English at least), isn’t getting through to all customers. This is where I blame the ocean conservation world. In my opinion, the messages about marine debris are barely reaching the target audience. Although a good first step, I don’t need these resources. I, like your other fans, know this – that’s why we are fans. We get it, but that person, fishing down the street, doesn’t get it — even when it’s staring him in the face. How can we make HIM, and those enabling him to continue trashing the ocean, get it? We can all close out eyes and see a trash-free world. But we all need to open our eyes a bit wider to acknowledge there is a problem. “We could enforce littering fines. It might curb some of the littering!” good idea!